Posted in Course Related on the 18th of March 2019. 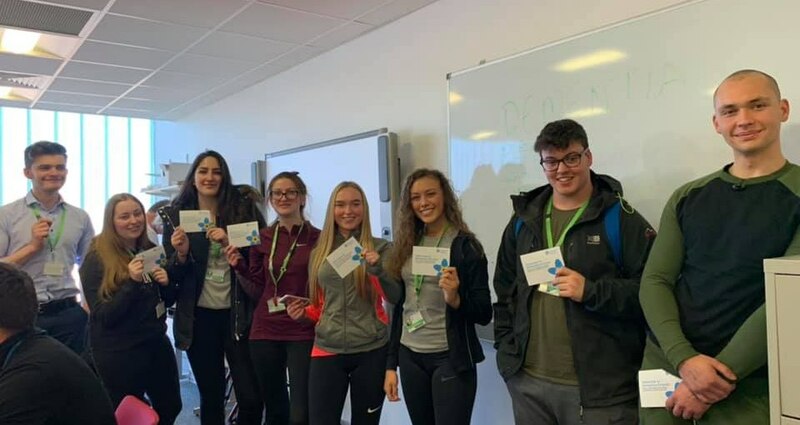 Students from the Health and Social Care Extended Diploma course are now official champions of the “Dementia Friends” programme, after a training session with the Alzheimer Society on Wednesday 13th March. The students were presented with a badge and certificate in return for their pledge to promote dementia awareness with new acquaintances, in the workplace and amongst family and friends. The launch of the Alzheimer Society’s Dementia Friends programme is the biggest initiative of its kind to change people’s perceptions of dementia. It hopes to transform how the nation thinks, acts and talks about this debilitating condition. In the UK alone, there are 850,000+ people living with dementia, with the figure expected to rise to more than 1 million by 2025.